VIEW OUR PENDANTS CATEGORY FOR OUR CURRENT SELECTION. Small 14k rose gold heart charm. Heart measures approx. 1/4" wide x over 3/8" tall with hoop. See our collection of quality heart jewelry. This sweet little charm is a perfect way to show any special person that she's close to your heart. 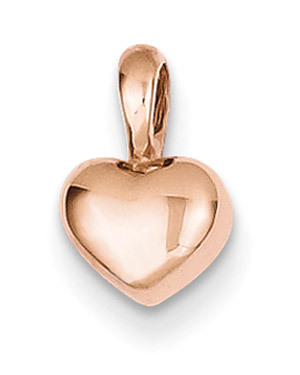 The timeless design of this 14K rose gold heart charm makes it a timeless symbol of love that will never go out of fashion, whether it's worn on a charm bracelet or on a chain like a necklace. Highly-polished 14K rose gold gives this piece a soft, warm glow. At 1/4" wide and over 3/8" tall including the hoop, this heart charm is petite and perfectly pretty. We guarantee our 14K Rose Gold Heart Charm to be high quality, authentic jewelry, as described above.